Friday 10th June Freedom building monthly social from 6pm until 9. Saturday 18th June National Protest against the Housing and Planning Act, gather 12 at Hyde Pk Corner. Didn’t they learn anything from the attempted eviction of Can Vies two years ago, and the popular response that ensued? Have they not yet understood that when you attack the autonomous fabric of a neighbourhood in a city like Barcelona, it will cause the underlying the social, political and economic contradictions to erupt? Squatters Action for Secure Homes (SQUASH) has been tracking implementation of section 144 of the Legal Aid, Sentencing and Punishment of Offenders Act (s144 LASPOA) since it came into effect in September 2012. Section 144 criminalises squatting in empty residential properties, gives the police new powers, and guilt is determined by a lay magistrate, rather than a trained judge. Since 2012, there have been at least 738 arrests, 326 prosecutions and over 60 convictions for the offence. The consequence of the new law, are now starting to be felt. Night of Mod: 60’s R&B, Motown, Northern Soul, Jamaican Ska, Calypso & Rocksteady. DJ’s: Lou Pino & DJ Lee (Resident DJ @ITC). Upstairs at T. Chances Venue, 399 High Road, London, N17 6QN. Nearest Tube – Seven Sisters. Buses 41, 123, 149, 243, 279, 254, 476. N41, N73, N76, N279. People might think something needs to be done about Shoreditch, but on the 3rd March an Interim Possession Order was granted on the whole of the Bishopsgate Goodsyard, including Shoreditch High Street station, the football pitches, the car wash and the “boxpark” shops. Anyone in occupation at the time that the order was served should have left the land, and anyone using the station or the football pitches, or entering the shops could have been liable for arrest if accused of, or considered by police to be trespassing. How would they tell? There was meant to be a follow-up hearing on the 10th at which the IPO might have come to an end, and at which a full possession order might have been made, giving Network Rail the right to bring in bailiffs to remove everyone from the land. That would be interesting. The IPO was made by Mrs Justice Asplin DBE in the High Court, having agreed that service of the claim and application be reduced to 5 hours and 45 minutes. The claim doesn’t seem to have been served on all of the land covered by the order. A Guy Thornet for Network Rail had signed a statement that there was nobody else with any right to occupy the land, ignoring the thousands of people with a licence or tenancy to be on the land. This could be considered by some to be a criminal contravention of s75 Criminal Justice and Public Order Act 1994 as well as contempt of court. The IPO itself was obviously not served on the whole of the land claimed, but was found on a mainly unused gate round the back. It was not in the correct format, but was cobbled together by Network Rail, and did not make clear what land was covered. So, all in all it would be pretty easy to argue against arrest and/or conviction, but it is concerning that an order was made that so clearly included land that wasn’t served and whose occupiers had every right to be there. 13-14 February: Weekend of Action: Love Council Housing, Stop the Housing Bill. 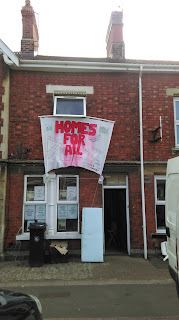 13 March: National Demo: March For Homes – Against The Housing Bill, 12.00 Lincoln’s Inn. The 14th edition of the Squatters Handbook is being worked on! We are looking for relevant pictures (photos, cartoons, diagrams), offers of proof-reading or lay-out, any comments on anything in the last handbook or our current leaflets to correct or improve. We don’t promise to use anything. The next debate on the bill is the first week that MPs are back, on Tuesday 5 January. So we need to hit the ground running in 2016. Join the rolling demonstration outside parliament from 12 noon, followed by a Kill the Housing Bill campaign meeting inside from 5pm (allow 30 mins to get through security). The Kill the Housing Bill campaign also has an organising meeting on Saturday 16 January, from 11am to 1pm at the Unite offices at 128 Theobalds Road, London WC1X 8TN. If you can’t make it to either of these events (and even if you can), you can also contact your MP and demand that they don’t let it through. You can find a template letter here. Let’s stop this attack on homes for all!